Improve the value of your residential or commercial property affordably and efficiently by ordering our stylish and durable hardwood flooring. Our engineered, solid, and handscraped hardwood comes in many rich textures and shades to give your property a warm and inviting feel. Welcome your guests or customers into your home or office and impress them with your interior design skill when you install our exquisite flooring materials. No matter what type of style you are going for, you are sure to find the hardwood floors at our store that fit your needs in looks, performance, and price. Find stunning flooring material that is perfectly suited to your living or working space by browsing our large selection of options. If you are searching for surface coverings for areas that are located belowground, you should consider our engineered hardwood. Consisting of multiple layers, this material has a strong core and a high water resistance that makes it suitable for lower levels where moisture may collect. Plus, the unique structure of this product keeps your floors from shrinking or expanding due to various weather and humidity changes. Add some color to your basement environment and turn it into one of your new favorite rooms by putting in our engineered hardwood. This flooring can be easily installed over concrete, so do not let having concrete floors stop you from changing to a hardwood design. Get the rustic and natural-looking environment you want with our classy wood flooring. Although this product is made up of multiple layers, it is still built from authentic wood materials. Imagine the feel of smooth and solid hardwood floors beneath your feet. These sturdy surface coverings are comfortable to walk on, but they also create a stylish and elegant atmosphere in your home. They can also add a sense of strength and professionalism to your place of business. How you choose to alter your environment with our hardwood flooring is up to you, and our team of flooring experts will work hard to make sure you receive the outstanding results that you expect. Unlike our engineered hardwood, the solid hardwood is made out of a single piece of wood. This type of flooring looks excellent in homes that have a more traditional decorating style. Do not worry if your floor shrinks or expands over the years because a quick sanding and smoothing over is all our product needs to stay in good shape. This type of hardwood also comes in many shades and designs. Create a custom look for your home and make your interior property look like it belongs on the cover of a magazine. Take your home’s interior design to the next level when you order our handscraped hardwood flooring. This one-of-a-kind material gives your property an earthy and texturized style with its rugged design quality. When you select handscraped flooring, you are able to fully appreciate the craftsmanship that went into creating your floors. Some of the original indentations and scratches are still visible in your surface material. Rest assured that handscraped hardwood is carefully designed to give you a more rustic quality while still maintaining overall stability and style. The textured look of this material is useful because it camouflages any scratches or marks that may appear on your floors through the wear and tear of everyday life. Enjoy a charming country style in your home by ordering our handscraped flooring today. Whether you prefer solid, engineered, or handscraped hardwood floors, you will find a multitude to choose from at our well-stocked showroom. The design possibilities for your home are endless. From glossy design to rugged charm, we cater to your exact needs to help you achieve your very own interior design aesthetic. Once you have made your style decision, leave your hardwood flooring installation to us so you can receive your dream results as soon as possible. 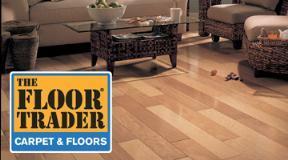 Shop at our flooring store and get more than just high-quality products and friendly service. With our beneficial at-cost hardwood flooring installation program, you get linked with a local, certified installer for no added fee. Simply come by our showroom, select your ideal hardwood floors in the hue and finish of your choice, and take them back with you for installation the same day. You can’t go wrong when you choose our reputable discount flooring store. We have been proudly serving the community for more than 15 years, and our company was recently named Franchisee of the Year. Contact us to bring a dignified look to your home with our elegant hardwood flooring. We are proud to serve residents within a 60-mile radius of Lake Charles, Louisiana.